A little Dolph-Ish wouldn’t you say? I walked past this on the video shop shelves for at least a year before I decided to check it out, even though the back cover blurb sounded right up my alley. The reason was simple, take a look at the cover image above and tell me it doesn’t look like Dolph Lundgren to you. Now I have said it before, but I simply don’t have time to deliberately watch terrible movies, and being that I thought Dolph was in this there was no way I was going to bother. I can assure you that Dolph is actually not in this. I can also assure you that if you don’t mind your films with some theological elements that you’ll love this. I myself am an atheist but for some reason I love it when filmmakers explore the scope of religious works, even more if they manipulate it subtly to meet the needs of their story. Thomas (Elias Koteas) is about to be ordained a Priest, only for some reason he loses the plot at the swearing in ceremony and abruptly leaves the church altogether to join the police force. Some time later he is visited by Simon (Eric Stoltz), who claims he is an angel. Thomas is you could say a tad sceptical and says as much to Simon. Shortly after this meeting Simon is attacked by someone who jumps through the window of his first floor flat. During the scuffle Simon pushes the assailant back out the window to the street below, where the unfortunate is immediately hit by a car. Our car accident victim buddy has the triple whammy. Not only has he just been thrown out of a first floor window, but he is also then hit by a speeding car. Thennnnn, he is squooshed against a wall by the car to add injury to injury, to injury. Unless it is movie magic, so let’s just agree that it was movie magic and move on you say? Done. You’ll never guess who is called in to investigate the crime scene: Thomas, that’s who. Another digression: You know it is a niche market when the force employs an angel specialist. You think he had many cases? Unless the TV show Touched by an Angel was far more literal a title than we thought all these years. Back to the crime scene. Thomas is a little surprised to find the victim lost his eyes, and not in the crash, he never had them. Also the hotel room has been trashed and when dusted for prints not one is uncovered, but Thomas’s book on Angels is. We cut to a remote school with a small group of students, Catherine (Virginia Madsen) seems to be the only teacher of the one class covering all ages and grades. Simon is now hiding out in a run down and unused part of the buildings. This town is where the bulk of the rest of the story takes place. To fast track matters Simon is now holding onto something that is much sought after by his yet unnamed rivals, and they want it. Bad. As every good film requires conflict we immediately get to meet the other interested party, his name is Gabriel and he was once the right hand man to God himself. Gabriel desperately wants what Simon holds, as he feels it will tip the balance in an Angelic war that has been waged for countless years in his favour. In Gabriel’s eyes humans are no more than “talking monkeys”, and he detests us for how we are apparently viewed by God, feeling that angels have somehow received a bad rap. Expanding on the simple premise above would result in much complication, none of which is necessary here, but know first that The Prophecy intertwines an intricately crafted backstory into what many believe, and does it very well. There are some great standalone scenes, minimum “BOO!” scares a powerful ending. Whether you believe in this stuff or not probably will have a bearing on what you think of the film. If you are already a believer the odds are that you will hate this or at least just take it as a fantasy story, I can’t see why this would create anger in the religious community. If, like me you think this is all a work of fiction then you may find a lot to like here. Again I am an absolute sucker for theological elements in film so I lapped this up. 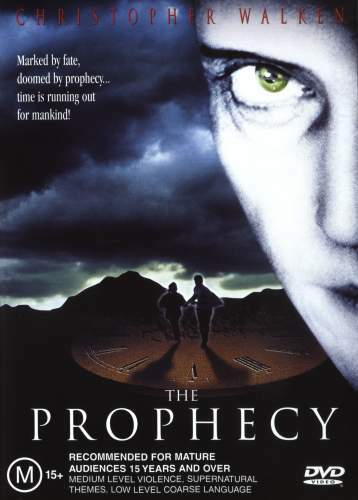 I thought everyone in was effective, most notably Christopher Walken as a perfectly pasty and dare I say it otherworldly Gabriel, and Viggo Mortensen stole the finale with a bit part that veered close to parody but ended up suiting the tone of the film. The only negative I can throw at The Prophecy is that Gabriel and his undead lackeys were used to attempt to add some levity, only it felt quite out of place at times. Gabriel is perfectly amusing with most of his dialogue without forcing the issue with cartoony stuff. Final Rating – 9 / 10. One of my personal favourites. I just wish they didn’t make 4 unnecessary sequels.